"You gotta remember, they will skin you if you're not real good. You gotta outsmart 'em! You gotta out-quick 'em! Now push it!" When I set out to create the Forgotten Films column, I had three criteria for which I would consider spotlighting a particular film: It was more than ten years old, it was by and large not really talked about anymore, and it was well worth your time to seek it out. 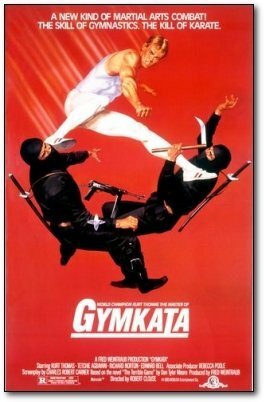 I must unfortunately bend two of those rules to bring you today's film, 1985's gymnastics/martial arts hybrid action epic Gymkata. First off, it's in the ether lately as Earwolf's podcast "How Did This Get Made" featured the film on their most recent episode, and Red Letter Media also spotlighted the film on their latest edition of "Best of the Worst." The most interesting thing about Gymkata, and the one you should keep in the back of your mind while watching the film, is that it is directed by Robert Clouse, the man behind arguably the two greatest Bruce Lee films, Enter the Dragon & Game of Death. This film effectively ended his career, consigning him to a life of directing straight to video films starring Cynthia Rothrock before his death in 1997. It's also worth noting that the film is actually based on a book titled "The Terrible Game" by Dan Tyler Moore, which, as far as I could tell, featured no gymnastics. So what is Gymkata, you ask? It's the story of a US gymnast named Jonathan Cabot (real life gymnast Kurt Thomas) who is recruited by the US government to travel to the small Eastern European nation of Parmistan. 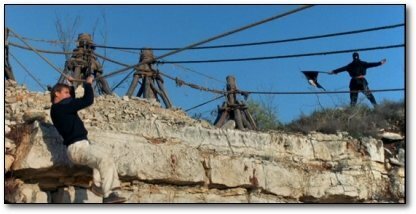 The US wants to install part of its Star Wars missile defense system in the mountains of Parmistan, but the current leader's regime is under siege, threatening to unravel the entire plan. Since Cabot is told that "direct military action is out of style," and that if one man were to go to Parmistan, enter a competition called "The Game," and survive, he is allowed "his life and one request." Time is of the essence since "a lot of other people want that one request," so Cabot must train and train hard to survive the game. The Princess of Parmistan (Tetchie Agbayani) is in charge of Cabot's training, and I don't need to tell you it won't be long before these two are falling in love, least of all because the plot dictates it. 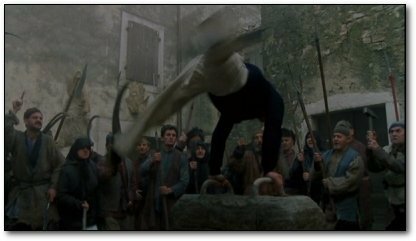 After a laughable training montage, Cabot heads to Parmistan to compete in "The Game," and his life is saved several times by the fortuitous appearance of various pieces of gymnastic equipment such as a horizontal bar or pommel horse. The leader of Parmistan looks, as wisely observed by both Jay Bauman of RLM & Jason Mantzoukas of HDTGM, exactly like Mel Brooks. How does this account, then, for his obviously Asian looking daughter? A line of dialogue attempts to explain this away, but it's yet another example of either careless or rushed production decisions in a film teeming with them. Take for example the sudden appearance of a horizontal bar in an alleyway leads to a gymnastics display/kicking the bad guys in the face sequence (complete with conveniently chalked hands for our hero). Is this tongue in cheek or were the filmmakers attempting to place a gymnast in a "realistic" action scenario? It hurts my brain trying to even rationalize the latter. One can only assume that this film was fast tracked into production due to the gymnastics craze presumably brought on by the1984 Summer Olympics in Los Angeles, but like all things, that flame was extinguished by the time the film hit theaters the following May. I would have to suspend my disbelief to the breaking point to think that these filmmakers were trying to ignite a new dimension in martial arts films, so I can only guess that they were hoping to cling to the Olympics' coattails for a scosh longer. It's the only plausible explanation for this film's existence. One of the things that I'm surprised no one talks about in regard to this film is just how awful the score is, composed by Alfi Kabiljo. It sounds like a parody of the scores of Lalo Schifrin (Planet of the Apes, Mission: Impossible) or even Gerald Fried's legendary score to the Star Trek Original Series episode "Amok Time." It's so woefully derivative that it can't help but make you laugh every single time it begins blaring over the action. Other ludicrous things that happen in the film include Cabot's telling his government liaison that he's headed to "Karabal, on the Caspian Sea," only to have that appear, verbatim, as a title card over the next sequence. I can't tell if they knew how ridiculous this all was because of subtle things like that, but somehow I surmise it's just wishful thinking. Bad movie connoisseurs, such as myself, love to think that certain filmmakers were forward thinking enough to understand how ridiculous certain film premises were, but as many many failed attempts in recent years have shown, it's virtually impossible to set out to create a bad movie. The Tommy Wiseaus & James Nguyens of this world can only succeed in creating such legendarily bad films as The Room & Birdemic because they set out to create just the opposite. The truly enjoyable bad movies of this world were attempts by people to make something good, or at the very least, entertaining. 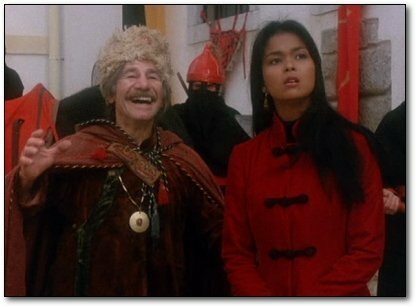 Gymkata is as entertaining as bad movies get. It's a time capsule film to be sure (Kurt Thomas' mullet all but ensures that), but it will be adored by generations of bad movie lovers to come. It's sad that the martial arts/gymnastics hybrid action film was both birthed and died here, but watching this film, one can dream of a world where that was the dominant sub-genre of the waning years of the Reagan administration. And who knows, maybe some wizened (or Wiseau'd) filmmaker will take another crack at it... It's got myriad possibilities.